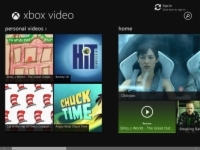 If you want to stream videos directly to your Xbox, the Windows 8.1 Metro Xbox Video app lets you control the streaming. The Metro Xbox Video app works almost exactly like the Music app. 1Tap or click the Metro Xbox Video tile. You see an app that really wants you to buy or rent a movie. 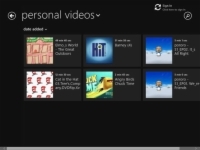 Way over on the left, your videos appear — assuming you have videos in the Windows Video Library. Many people store videos from their phones and cameras inside the Pictures Library. That’s a good place to put them — the Windows 8.1 tiled Pictures app, Windows Media Player, and VLC will find them there. But the Xbox Video app doesn’t look through the Pictures Library. 2Tap or click the My Videos link at the upper left. You may have to scroll, scroll, scroll to get there. A scrollable list of tiles appears. In the Date Added drop-down list, choose a sort option such as A to Z or Duration. 3Tap or double-click a video to play it. 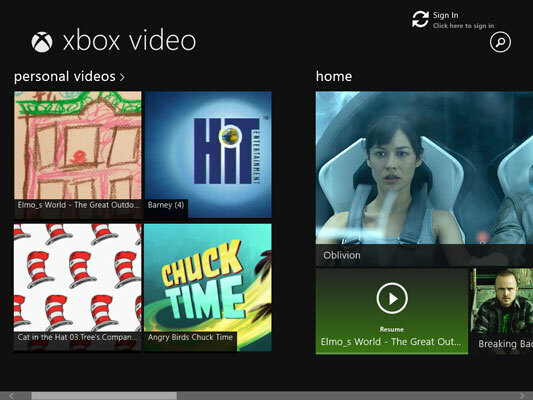 When you’re done, tap or click the back arrow in the upper-left corner to return to the movie tiles and tap or click again to go back to the main Xbox Video page. 4On the main page, to buy a movie, or play a trailer on your computer or Xbox, tap or click it. The movie trailers are identical to what you see on Rotten Tomatoes’ website, except Rotten Tomatoes usually has several trailers for each new release. Plans are afoot to have the Metro Xbox Video app supply you with movie show times, and even let you buy tickets online — Microsoft gets its cut, of course. Those features weren’t available as this book went to press.